In 1967 a Cincinnati-based ownership group led by Paul Brown was granted a franchise in the American Football League. As the founder and head coach of the Cleveland Browns from 1946 to 1962, Brown led his team to a .759 winning percentage and 7 championships, which includes 4 championships earned while a member of the All-America Football Conference. Brown became a recognized innovator for his approach to training, game planning, and the passing game. However, Brown sold majority interest in the team in 1961 to Modell. On January 9, 1963, Modell fired Brown. By 1966, Paul Brown wanted to become involved in professional football again. James A. Rhodes, then the governor of Ohio, convinced Brown that Ohio needed a second team. Cincinnati was deemed the logical choice, in essence, splitting the state. Brown named the team the Bengals in order "to give it a link with past professional football in Cincinnati." Another Bengals team existed in the city and played in a previous American Football League from 1937 to 1942. The city's renowned zoo was also home to a rare white Bengal Tiger. However, possibly as an insult to Modell, Paul Brown chose the exact shade of orange used by his former team, the Cleveland Browns. He added black as the secondary color. 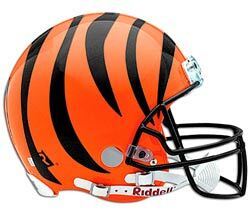 Brown chose a very simple logo: the word "BENGALS" in black lettering. Ironically, one of the potential helmet designs Brown rejected was a striped motif that was similar to the helmets adopted by the team in 1981 and which is still in use to this day. 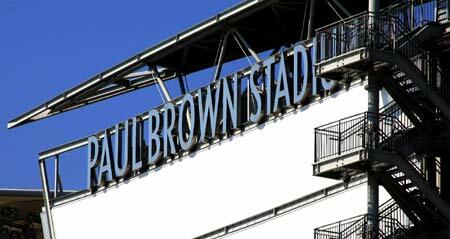 Mike Brown, the current owner of the Cincinnati Bengals, named the new football stadium after his father, Paul Brown, resisting offers to sell the naming rights for the stadium -- some things are too important to put on a price tag.